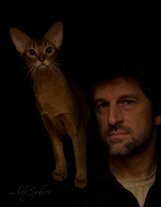 This cat people interview is of Oleg Alexeev - I found his website when I was searching for photographs of Abys. His pictures were so beautiful I wrote to him asking if he would kindly give permission to publish them on my site and to my joy he gave the permission. Oleg clearly loves Abys - and jsut as clearly the Abys feel comfortable in their photo sessions with Oleg. So I thought maybe I could get a cat people interview from Oleg and sent him some questions. 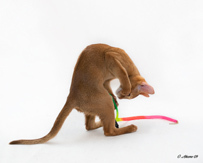 1) What was the reason you made you interested in the Abyssinian cat in the first place? Did you meet a special Aby cat that melted your heart? Or did you study cat breeds and decided after that to get an Aby? 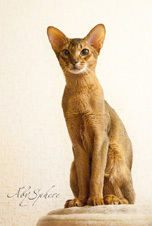 Oleg: We did not know much about the Abyssinian breed initially. And so, like so many other people, we just bought a cat that was available from a commercial cattery. Our Aby had some flaws and issues with her health, but she had a great Abyssinian temperament! She is the reason we decided to start breeding Abys. 2) Who was/is your very first Aby? Oleg: Her name was Shulamith (Sheba). 3) Can you name the most favorite Abyssinian cat in your life so far? 4) How long have you been breeding Abys? Oleg. We have been breeding Abys since 2008. 5) Where are you / your cattery located? Oleg: We are located in St. Petersburg in Russia. 6) Do you ship your Aby kittens to other countries as well? Oleg: Yes, that can be arranged. If someone is interested, do contact us. 7) You are a wonderful photographer of Abys - you can tell the cats really enjoy themselves in those photos. They are real cat art. Did you study photography or learn by yourself to be so good at it? 8) What is the hardest / most difficult thing when photographing cats? Oleg: I would have to say the independence of cats is the biggest challenge – they would have to want to cooperate with you for the photo shoot to be successful. 9) What is the funniest thing that happened to you when photographing cats? Oleg: That would be when we were by the shore of the Baltic Sea and our red Abyssinian Pippi decided to have a little dip in the sea. So it is not a legend that Abys can really like water! Just look at the pictures here. (The whole series is on the Abyssinian Cat -page). 10) Can you name an Aby photo that is your all-time favorite? Oleg: That is the photo I have named “the Periscope”. It is attached here. 11) If people are interested in your photographs / purchasing kittens, where can they reach you? 12) Could you imagine a life without Abys?